It’s been a wild year for comics—full of swirling, grand relaunches and controversial events, but more importantly, some damn good books. 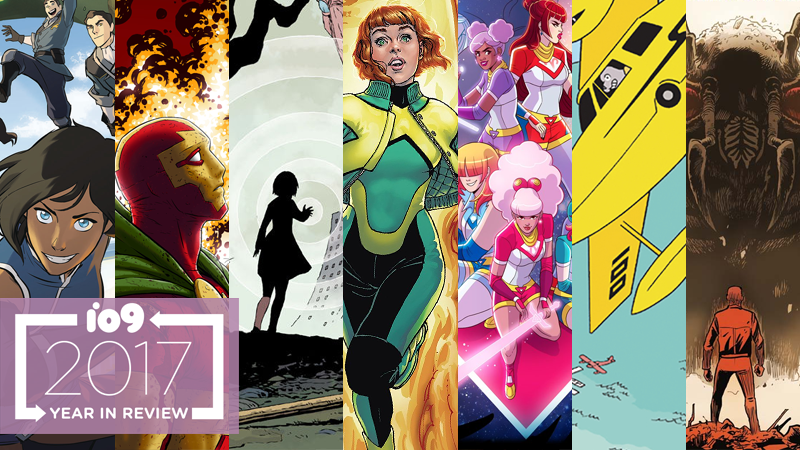 As ever, it’s tough to whittle down the multitude of stories and characters we’ve read about this year into a list of the best, but here are 15 of our absolute favorite comics of this year. It took a while to finally come out, but Dark Horse’s official continuation of the Legend of Korra story, taking place just weeks after the conclusion of the TV series, was a pitch-perfect continuation. Combining a warm familiarity of characters who’ve been missing from TV for three years with pushing Korra’s story into new directions, while still feeling faithful to the core themes of the show, Turf Wars is pretty much what Korra fans wanted out of a new tale: Something that feels new while still feeling like a logical continuation of a story and world that still had much more to tell. Somewhere between the lighthearted whimsy of Harry Potter and the overly-serious smugness of Lev Grossman’s Magicians series lies Mystik U, a comic in which we see some of DC’s heaviest magical hitters attending magic school (as teens) for the very first time. Characters like Zatanna and Enchantress are reimagined as moody, modern kids suddenly plunged into a murder mystery on their very first day at university and, of course, hijinks ensue. Though the story’s only just beginning, it’s the kind of tale that’s perfect for pulling new readers into the more arcane corners of DC’s books and getting acclimated with more obscure characters you don’t always see running around with the Justice League. At times absurd, yet consistently emotional, Abstract Studio’s scifi series Motor Girl came to an end this year in emotional fashion: Telling the story of a war veteran named Samantha who confides in a giant gorilla only she can see and hear amidst the backdrop of an interstellar conflict slowly making its way to Earth over the course of the series. But while the overall plot is scifi—blending the surreality of the alien threat Earth faces with Sam’s very real troubles—the meat of the book is about Sam’s experiences as a soldier and prisoner of war. Her conversations with her imaginary best friend and the totally real people around her paint a heartbreaking picture of the troubles soldiers have when returning from war. Terry Moore, who is best known for his books Strangers in Paradise and Echo, uses his art to draw a subtle line between the cartoonish surreal inhabitants of Samantha’s life and the humans still waiting for her to come home. One of the best and worst things about comics books is the fact that they’re pretty much always coming out, which means two important things: There’s probably always something to read and you’re pretty much guaranteed to be perpetually behind on keeping up with what’s happening. Zodiac Starforce is the rare series that actually gave its readers a chance to breathe and settle into its fantastic world of magical girls and haughty demons. The comic returned this year with Cries of the Fire Prince, a follow up series starring a glamorous villain who’d be right at home amongst Sailor Moon’s rogues gallery. Zodiac Starforce: Cries of the Fire Prince is both a love letter and a deconstruction of the magical girl genre, hitting many of the same kinds of narrative beats while also taking the time to let characters actually live within those moments in a way that you don’t always see in anime and manga. The story’s fun and lighthearted, but also knows exactly when to take itself seriously and when to just let loose and have fun. Calexit is both an excellent comic and a striking thought experiment. “What if,” the comic asks, “in response to Donald Trump’s draconian presidency, California simply decided to secede from the rest of the US?” It’s an idea that floated around in the immediate aftermath of the election with many envisioning an idyllic scenario in which Californians proved to the rest of the country that they wouldn’t tolerate the White House’s commitment to disenfranchise and materially hurt marginalized people. But Calexit takes the fantasy of that scenario and actually delves into what all kinds of very real-world repercussions such a turn of events would have both for California residents and the rest of the U.S. The economic entanglements, conflicts, and general uneasiness that define Calexit’s narrative speak to the complexity of the ideas at work. There are no clear, easy answers, but that’s not quite what the series is going for. It’s a story about the journey. After setting up its strange premise of Silver Age superheroes being transported from their city to a mysterious, isolated rural town they can never leave, Black Hammer’s second year has been devoted to slowly but surely lifting the layers off from the superpowered, square-jawed “traditional” heroes its lead cast parodies to reveal the pasts and insecurities of the human people behind the personas. Black Hammer revels in the banality of superpowered life between the big fights, giving as much weight and importance to the old battles of Spiral City’s glory days as it does the moments personal anguish these heroes now feel trying to make a new life for themselves. In 2017, Black Hammer has become less of a deconstruction of the classic old-school superhero comic and more or a quiet, albeit gripping, slice-of-life drama about the reality of people who also happen to be superheroes. An unabashedly earnest dedication to the Franco-Belgian aesthetic of series like Tintin or Asterix, Rich Tommaso’s Spy Seal is a delightful marriage of a simple, clean art style with an absurd-yet-charming Cold War-esque story of anthropomorphic animals engaging in a thrilling spy adventure. What makes Spy Seal such a read is how it so wholly embraces its homage—Tomasso doesn’t just borrow the bright colors and clean lines of Hergé, but the lilting dialogue, and an airy sense of adventure that harkens back to a bygone era of comics. Spy Seal finds charm in its sincere simplicity, and has it in spades. In comics, witchcraft is often depicted as a larger-than-life, almost divine kind of force that practitioners wield with a scientific sort of precision. In Redlands, however, magic is a primal, untamed force that works in concert with a trio of witches who descend on a small Florida towns that’s rotting from the inside with corruption. At its core, Redlands is a story about power—those who have it, those who perceive themselves as not, and how that imbalance, or the perception thereof can make people justify their actions towards one another. Centipede is the kind of comic that will take you by surprise multiple times for a multiple number of reasons. You wouldn’t initially expect a licensed comic based on an 8-bit arcade game from nearly 40 years ago to be particularly compelling, and yet that’s exactly what Centipede is. After the titular centipede lays waste to the population of an entire planet, one man is left to hunt the creature and reflect on what all it means to be the last of one’s civilization. Centipede makes a point of exploring all of the ways in which nostalgia can profoundly impact a person’s well-being, but the series cleverly plays with how we as a society have come to think of nostalgia within the specific context of comic books and nerd culture. Nostalgia, here, isn’t just for video games and entertainment, but for the everyday experiences one has as a person living in the world. For a long time The Mighty Thor has quietly been one of Marvel’s best ongoing series, but in 2017, Jason Aaron entered his third year of writing Mighty Thor with Jane Foster as the titular hero, and it’s been his strongest. The story has wildly expanded in scope, as Jane finds herself dealing with wars across all of the nine realms of the universe, giant cosmic threats like the Shi’ar empire, and, currently, an apocalyptic creature known as the Mangog threatening to wipe out every god in Asgardia. Thesee epic conflicts are bought to life through some of the most sumptuous and grand vistas in comics courtesy of Russell Dauterman and Matt Wilson’s sublime art. The Mighty Thor brings to mind the very best of Walt Simonson’s iconic run on the character, but even with all the superheroic craziness, the true heart of Mighty Thor has forever remained the story of Jane Foster, the push and pull between her weakening, cancer-ravaged human form and the desire to do so much good as a hero—a story that has remained both tragic and endearing even as Aaron and his team have crafted a cosmic story worthy of the Goddess of Thunder. Writer Tom King’s run on Batman has been defined by something we so rarely see in ongoing iterations of the Dark Knight: Bruce Wayne’s pained vulnerability. King’s Batman has repeatedly opened himself up to the people around him—especially Selina Kyle, who this year has become Batman’s closest personal confidante and his fiancée—revealing the raw emotions that drive him to do what he does. Combined with some thrilling storyarcs (in particular “The War of Jokes and Riddles”, a twisty-turny flashback to Batman’s earliest years that was at times so stunningly tragic it managed to make us rip our hearts out over Kite Man, for crying out loud), it’s hard to remember a time when reading Batman has been this emotional experience, and it makes for a fascinating and refreshing read. Even though Jean Grey’s a founding member of the X-Men who’s been the focal point of many of Marvel’s most defining stories, there’s never really been much of an effort to truly explore who Jean—the person—is, or how she sees herself. Jean Grey takes one of the X-Men’s most convoluted plotlines involving time travel and uses it as an opportunity to give a teenaged Jean a look at the world shaped by her older self and the Phoenix Force. In seeing Teen Jean confront her peers from the future, Jean Grey exposes just how much our ideas about the heroine has been largely based on other people’s perceptions and expectations of her. As Teen Jean has struggled to get out from underneath her future self’s shadow, new parts of her personality and identity manifest and become fully realized. She’s a drastically more powerful and complex person than the Jean we’ve traditionally known, but she’s also more than aware that she can’t outrun her inevitable destiny to become a Phoenix avatar. Jean Grey’s a story about discovery and self-actualization that, despite all of its cosmic superhero trappings, will resonate with you on a deep level. Black Mask Studio has long been home to some daring and refreshing series, but this year one of its biggest has been Black, the initially Kickstarter-funded superhero series that imagined a world where only black people could manifest superpowers. Brutally encapsulating themes like police brutality and racial profiling, aside from telling a thoroughly grounded superhero story, Black paints an astonishingly vivid and at times ugly picture of the trials and tribulations of African-Americans in modern America, using the power and symbology of superheroes to speak to social injustices that are all too real in 2017—and in a rare manner for superhero stories, is refreshingly blunt about highlighting and decrying these injustices as something that exist beyond the pages of comic books. There is perhaps no book out this year that does a more fantastic job of humanizing and breathing new life into its central character than Saladin Ahmed and Christian James Ward’s Black Bolt. Though the Inhuman king has been a fixture of Marvel’s comics for decades, Black Bolt strips the monarch of his friends, family, power, and station in order to turn him into the most three-dimensional, relatable version of himself he’s been in recent memory. In Black Bolt, Blackagar Boltagon becomes a man—not in the sense that he is no longer Inhuman, but rather that we see him walking and living amongst the people in a way that grounds him. As Black Bolt and his companions try to find their way out of a horrifying space prison, the king’s personality rises to the fore and we see that he’s so much more than the silent, stoic person he’s most often depicted as. He’s compassionate and caring, but also vulnerable and haunted by the mistakes of his past. None of these things are exactly shocking—Black Bolt’s a rather regular guy, all things considered—but these are parts of him that, typically, are quite literally muted. In the same vein as King’s stunning work on The Vision at Marvel, Mister Miracle takes a decidedly weird and old-school comics character—Scott Free, Jack Kirby’s escape artist/son of basically from the Fourth World of godlike characters—and puts him on a dark, at times mind-bending path. In Mister Miracle’s case, this means examining an escape artist trying to escape the surreality of his own cosmically chaotic existence, figuring out what’s real and what isn’t as he and his wife Big Barda are flung into the violence and politics of an all-encompassing war between the forces of Darkseid and New Genesis. It’s a traumatic exploration of a group of extremely damaged broken individuals at the heart of interstellar cosmic weirdness that speaks to the lofty ideas of Jack Kirby’s legendary work. Mister Miracle is a series that rewards an undivided attention and a keen eye with both Gerads’ stunning, sketchy artwork (just as lovingly detailed at capturing the grand battlefields of New Genesis as it is the quiet, intimate moments between Scott and Barda), and a compelling and hauntingly relevant story about trying to find your place in the world, no matter how strange and bleak everything around you gets.